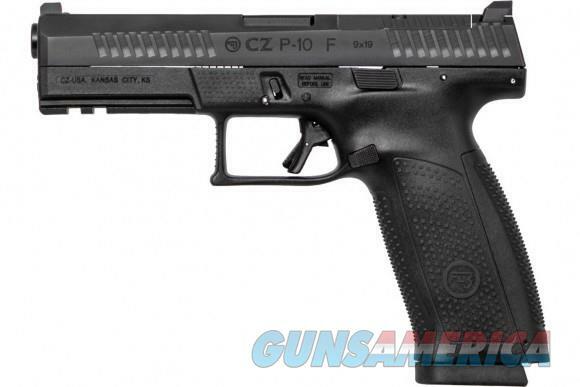 CZ95150 P-10 F 9MM BLK/POLY 19+1 OPTIC OPTICS READY 9mmUPC: 806703951508 MFG MDL #: 95150 MSRP: $590.00 CZ-USA CZ P-10 FULL SIZE 9MM CZ-USA The product photo may not represent the complete detail of the item being purchased. Please verify the product based on the model #, UPC #, description and specifications before ordering. CZ95150 PRODUCT DETAILS FAMILY:P-10 Series MODEL:CZ P-10 Full Size TYPE:Semi-Auto Pistol ACTION:Double Action Only FINISH:Black Polycoat STOCK/FRAME:Polymer Frame STOCK/GRIPS:Black Polymer WEIGHT:28.2 oz. CALIBER/GAUGE:9mm CAPACITY:19+1 BARREL:4.5" SIGHTS:FS:Orange Night Sight RS:Black SAFETY:Firing Pin Block/Trigger ADDL INFO:Slide Cut-Out for Optic ADDL INFO:Ambi Slide Release ADDL INFO:Reversible Mag Catch CZ USA 95150: The US-made P-10s retain all the features that have made them a resounding success- the crisp trigger, superior ergonomics and rugged reliability that set it apart from many in the striker-fired crowd. P-10s feature a single tritium lamp in the front with a large orange surround and a serrated black rear. Optics-Ready versions ship with a blank filler plate. One change that happens on both the US-made and Czech-made P-10s is the switch to a swappable magazine release. With a change in geometry, the goal was to eliminate the stiffness some customers experienced as the magazine release broke in, even though it became smooth after some use. This new reversible release just requires a few minutes to swap, allowing the pistol to remain lefty-friendly.